In the framework of item 4(b), we would like to bring to your attention the exclusion and discrimination of the indigenous Aramean people of Mesopotamia in a complex conflict area, the lands of the forefathers; which is also called ‘Aram-Nahrin’ in Aramaic, ‘Aram-Naharaim’ in Hebrew and ‘Mesopotamia’ in Greek. This ancient Semitic people, now divided into several denominations and spread throughout the Middle East, have been in Mesopotamia, the cradle of civilisation, for thousands of years and have made a great contribution to the world civilizations particularly through their language, the Aramaic also spoken by Abraham, Moses and Jesus Christ. Today, they amount to approximately 4 million people, worldwide, who have faced discrimination, ethnic cleansing, genocides and continuous persecutions for hundreds of years and still continues today. The area of Aram-Naharaim has been the scene of battles and conflicts for hundreds of years between various groups and peoples whose dictionary lacks words like peace, brotherhood and respect and seems resort to the path of intolerance and fanaticism; a path which has opened the way for bloodshed, hatred and genocide. It is this very path, which makes conflict resolution almost impossible. Many of these groups claim to be the rightful owners of Aram-Naharaim thereby neglecting the fundamental human rights and privileges of the indigenous Aramean people. The result of this intolerance expresses itself today in suicide and car bombs which is the daily reality in Aram-Naharaim. In spite of the fact that the Aramean people are caught, in a very difficult and complex conflict area, between groups and peoples whose only goal seems to be ruling and forcing others to their wiliness; the peaceful-minded Semitic Arameans have always tried to solve conflicts by living in peace and brotherhood with the other peoples in this part of the world, treating them with brotherly respect and obeying the laws of the countries in which we reside. Unfortunately, the Aramean concept of peaceful cooperation based on equality and mutual understanding; which is we believe a good way to solve conflicts; was not received with open arms by everybody in this part of the world. On the contrary, the injustice done to the indigenous Aramean people in the area of Aram-Naharaim for centuries in terms of discrimination; exclusion, ethnic cleansing and genocide cannot be explained by a pen and paper. The climax of torture and terror was reached in 1914-1918, when approximately 600.000 of them of different denominations were brutally slaughtered, whose innocent blood is still crying for justice. In the framework of this subject I feel forced also to say something about those who acted as “our brothers”; but unfortunately damaged our people severely. Nobody gave any attention to our cry caused by pain and wounds in a conflict area where it seems that there is only the law of the jungle valid. After hundreds of years being persecuted and ignored, we finally thought that the western missionaries, who came to the Middle East in the name of peace and brotherhood, would hear our cry. Unfortunately this turned out to be a miscalculation, since the missionaries, who were supposed to preach love and unity- a way to solve conflicts and to give others the example, acted quite conversely to their goal of preaching love and unity. Instead, they severely damaged our people by creating division, and split our people into several denominations, weakening and making our people vulnerable to those who are not sensitive to tolerance and peace. Indeed, we the Aramean Christians do believe fairly in love and brotherhood towards other Christians and non-Christians (no matter the denomination); because we believe this is the best way to solve conflicts. This has been the reason that we welcomed the Western Missionaries in the 16th and 19th centuries as our equals in faith of truth and justice. We thought maybe the Western missionaries could help us to protect us against the fanatical groups of the middle-east. Unfortunately this turned out to be a miscalculation! Although the name of our people and its history is very well documented by brilliant scholars of the Syrian Church of Antioch, the Roman Catholic Church and the Anglican missionaries felt it necessary to stick mythical names onto the minds of our people, which has caused us to be frequently misrepresented in some media by people who have no authority whatsoever to speak on behalf of our people. 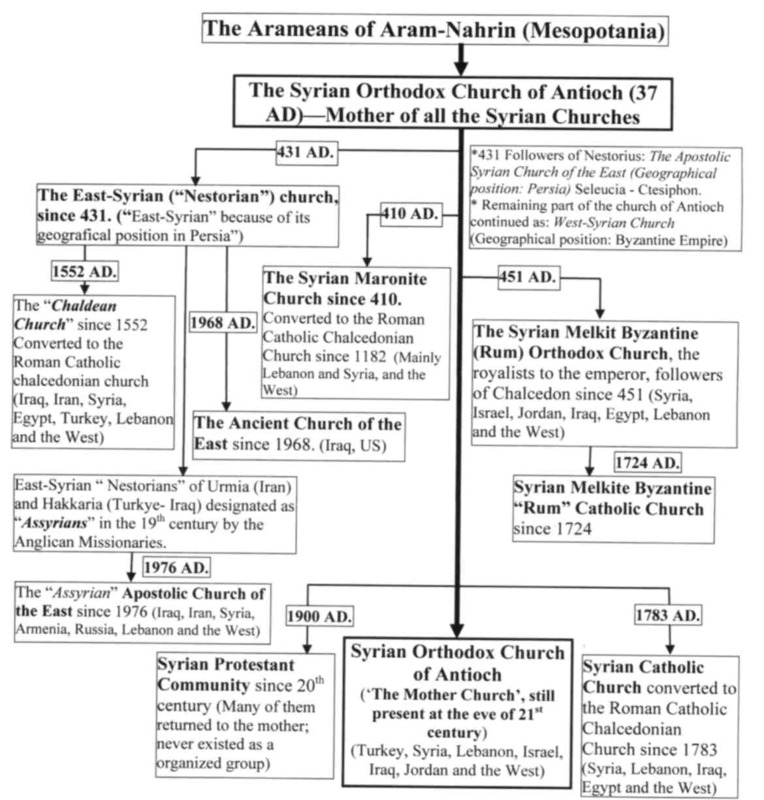 In 1552/53 the Syrian “Nestorian” Church of the East was split into two groups as a result of the activities of the missionaries of the Roman Catholic Church. The part of the Church united with the Catholic Church in 1552/1553 assumed the name “Chaldean” and with that, the Chaldean Church (of Babylon) was born. In the late 19th century, we see a similar thing happening. This time, being carried out by the Anglican missionaries, with the remaining part of the East-Syrian “Nestorians” of Hakkaria (bordering Turkey and Iraq) and Urmia (Iran), who were wrongfully identified as “Assyrians”; purely geographical and only applied to the “Nestorians”. The East-Aramean “Nestorians” prefer, since then, to call themselves “Assyrians” and try, by all means possible, to force this term onto other Aramean denominations by spreading plenty of biased information regarding the origin of our people and our language. These painful and mythical descriptions in reference to our people, invented by outsiders, who were unaware of the Hidden Pearl, which was, till the present day, buried beneath the persecutions and ethnic cleansing of past centuries, are definitely not in agreement with the historical facts recorded by the brilliant historians of the Church of Antioch who enlightened the world of their time, not only with the theological knowledge but with profane science as well. The new constitution of Iraq does not make any mention of the indigenous Aramean people; while those who have no indigenous roots in Iraq at all are mentioned in this constitution. The Aramean people in Turkey are not recognised as a distinct ethnic minority and although now and then permitted; officially it is forbidden to teach our sacred Aramaic language. The history clearly testify that we are the original inhabitants of Aram-Naharaim; that this part of the world bears our name; that we contributed to the world civilisations; that we bear with us an antique and rich heritage which has been developed and preserved for thousands of years; which is we believe not only our heritage but the heritage of mankind as well. For this reason it would have not only done justice to the historical facts and promoted the path of respect and dignity; but would have also given evidence of respect towards the heirs of the ancient history when they were included in the new constitution of Iraq. However where there is a will to equality and dignity, there is a way.